When you’ve been with a company that long, seeing gaps becomes almost second nature. 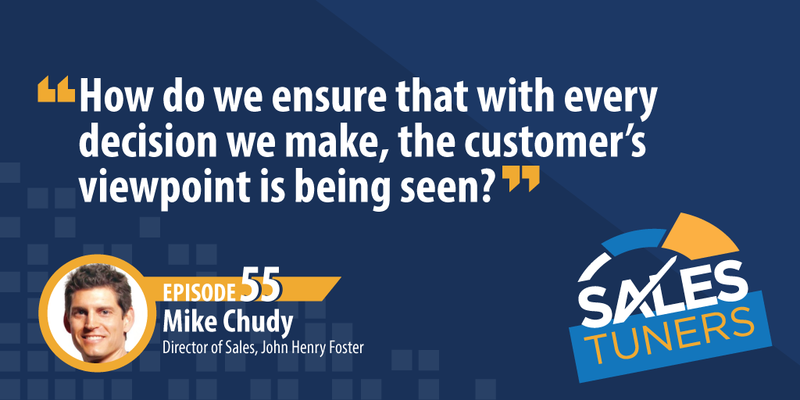 That’s what led Mike and a fellow colleague to create a sales academy inside of John Henry Foster. They were seeing too many young reps come through that lacked the essentials of sales acumen causing deals to go awry. His training runs the gamut from studying personality profiles of buyers to where to sit in a boardroom and even negotiating the fine details of contracts. Those tactical aspects of the job are part of Mike’s bigger vision of leaving a legacy that’s bigger than himself. Learn to Position Yourself: Rather than selling pieces of the puzzle, focus on what the entire puzzle should look like. Doing this helps you become seen as an expert in your field and one that can be a resource or even a consultant to your prospect so they call you when they have questions. If you do this successfully, price will rarely be an issue. Get to the Root Cause: Let’s be honest, prospects lie to us. Sometimes it deliberate, but other times they just don’t know. Instead of trying to sell to the symptoms or indicators of pain, dig deeper to figure out the root cause of the issue they’re experiencing. This may mean you need to be higher in the organization talking to someone who gets the bigger picture. Know Your Walkway Point: When entering a negotiation, it’s critical your know your BATNA – Best Alternative to a Negotiated Agreement. Once you know the limit, you’re able to frame the conversation and not be susceptible to low anchors your prospect is likely to throw out.